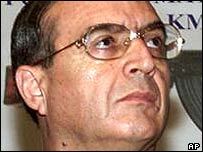 Peru's ex-intelligence chief has gone on trial over alleged extra-judicial killings of hostage-takers during the 1997 Japanese embassy siege. All 14 rebels died when commandos raided the ambassador's residence to free more than 70 diplomats who had been held hostage for four months. Prosecutors say Vladimiro Montesinos gave troops the order to shoot three rebels who had been captured alive. Two former military officers are also on trial with him. Mr Montesinos is already serving lengthy jail terms for involvement in an illegal arms sale and corruption. Rebels from the left-wing Tupac Amaru armed movement took over the ambassador's residence in December 1996. In April 1997, after months of negotiation, special forces launched a raid to free the hostages. One hostage, two commandos and all the rebels were killed. But one of the freed hostages, former Japanese political attache Hidetaka Ogura, said he saw up to three of the rebels taken alive. Mr Montesinos, former armed forces chief Nicolas de Bari Hermoza and retired Col Roberto Huaman are accused of ordering their deaths. Gloria Cano, a lawyer for the Pro-Human Rights Association representing relatives of the dead rebels, said the trial would help people find out exactly what happened. "We know that there were at least three illegal executions," she said. "We would like to know who the people responsible for issuing these orders were, and why they hid the truth." The men face up to 20 years in prison if convicted. The trial is expected to last several months. Opinion is still divided over whether the operation to free the hostages was excessive or not, says the BBC's Dan Collyns in Lima. One certainty is that Mr Montesinos, widely regarded as the shadowy force behind Alberto Fujimori's presidency, has precious few sympathisers left in Peru. Meanwhile Mr Fujimori is in Chile, where judges are deciding whether to extradite him to Peru to face corruption and human rights charges.